Stream X Signature is our highest performance streamer source component; it uses Cyrus’ state-of-the-art streaming engine and has been developed to provide the best sound resolution possible from a network audio library. It will fully exploit the highest quality 24-bit/192 kHz files. By removing all analogue audio components the Stream X Signature is a pure digital transport. 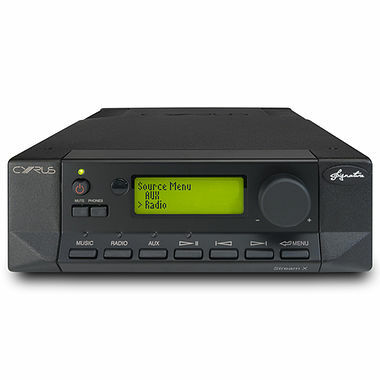 This gives the best performance when using a digital output into Cyrus’ high performance DAC’s. Wi-Fi or Ethernet, integration into your home network is effortless and reliable. Additional sources? No problem, there are 5 digital pass-through inputs, and high performance digital output. Make the most of the latest high resolution music files, or upgrade the quality of your CD resolution music1. Our flagship music streamer allows you to browse and select from your entire music collection using our Cadence app for iOS and Android. Stream from any UPnP or DLNA device, or use one of the streamer’s host of additional inputs to play music from your PC or mp3 player. With simple set up, seamless navigation and sensational sound quality, listening to music just got a whole lot more enjoyable!